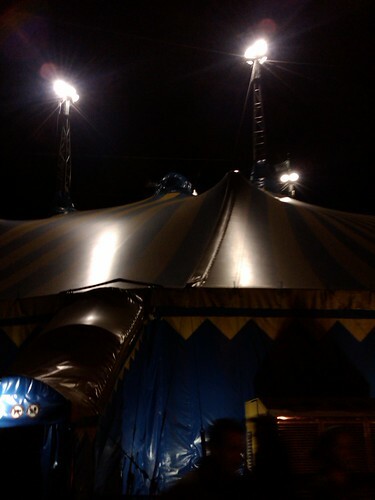 I had the chance to see Kooza in the Grand Capateu in Baltimore, Maryland. It was amazing show from Cirque. Kooza is up there on my list of favorite Cirque shows that I have seen so far. Seeing a Cirque Du Soleil show in the Grand Chapiteau was so much cooler then seeing one in a hotel or theater. That is an amazing experience in itself. As you know, after a show you converse about it, sharing likes and dislikes. So what is my favorite part? The Wheel of Death was so amazing and heart pounding. I caught Kooza on the CBC the other night. Wheel of Death was incredible!! Such amazing talent and the engineering/beauty behind the wheel itself was gorgeous. I was happy to see Cirque back to what I remember.